Crafts Galore! | Back Home Again: Crafts Galore! Hello to all Back Home Again readers....My name is Tracy. I blog over at Yea, I Know I'm Short. Holly was gracious enough to let me guest post for her today and I am thrilled to be here....so thank you in advance for reading. I wish I was a crafty person. Let me begin by saying, I try to be. Sometimes I succeed, sometimes I don't. Most of the time I don't haaaa. I wanted a hobby to keep my brain moving and cure my appetite for some sort of art. I have a board on Pinterest called "I could make that." Well, I like to think I could at least try anyway. I have made a couple things I am proud of though. I have redone some items as well. I bought a dresser on Craigslist for my oldest daughters room for $10 and re did it. Loved the results and so does she! I have made lampshades, tissue balls, and wreaths and rugs. Everything I have ever made has never cost me more than $25....thats my favorite part. It really is kinda simple if you just try...so I ask you want do you want to try, change, or do to improve your home or life? Try it! I promise you will be proud of your results just because you tried. Please stop by my blog and check out any projects I'm working on or share any that you are working on! As a small business owner, I know what you're saying. The convience of the bigger stores makes life better for me as a mom. But when it comes to special gifts and business projects, I try to shop local businesses often. Luckily my community has a thriving mom and pop business group, and it is not that hard to support it. There are three downtown areas in my city, and all three have always been pretty busy. There are so many great diners, restaurants and cafes to visit, as well as adorable shops that I frequent regularly. As a teenager my friends and I hung out in the different downtown areas all the time depending on who's house we were staying at. I would be sad if my city's downtowns became vacant. That burlap lamp shade is gorgeous and those gutters for bookshelves...I love those! I've seen them on Pinterest and have wanted to try it but just haven't found the time. I love love that dresser! I want to steal it because it would match my daughter's room perfectly. Tracy is a very crafty lady, even though she says she's not :-) I love the idea of crafts myself, but the execution...not so much! We are trying to instill this in our kids as well. I didn't have that growing up, but I'm definitely trying to change that with my family. Exactly! I have that kind of relationship with the owner of a local coffee shop I frequent. It's so nice. I actually wrote my master's thesis on courthouses and the courthouse square. So, you could say this is sort of a cause of mine! Thanks again Holly for sharing!!! Ladies if you need any help at all with anything please let me know and I can walk anyone through anything! That dresser cost me like $20, I bought sample paint and I won that stencil on the front. 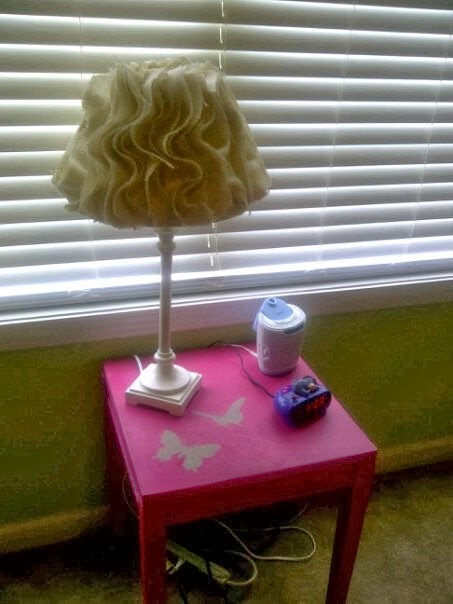 The burlap lamp shade, I do believe I burnt all my fingerprints off gluing everything with my handy dandy glue gun! Thanks Amber!! Like I said I think I have 2nd degree burns on my fingers from that lampshade but soo worth it!! And the gutters are great!!! So handy when you don't have the room for bookshelves. Thank you Michelle!! You can do it too!!! I would love to live in a small town like the ones that are pictured as I love these types of stores and homes with wrap around porches but I am in a small town inside Fort Worth and there is nothing like this where I am. So when I have a chance I leave and go visit the small towns as you said there stores are one of a kind. 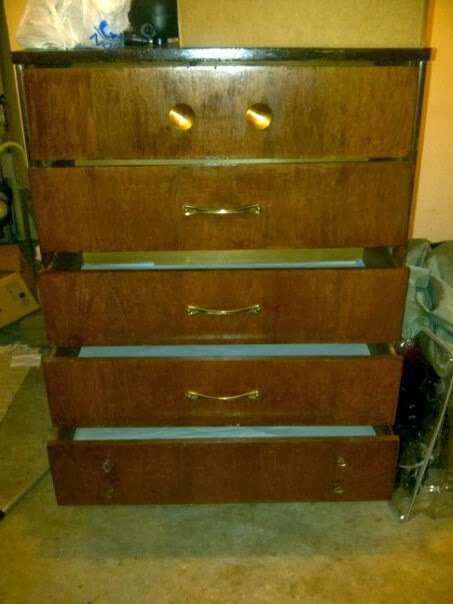 I really love that dresser! It looks great!